53 days on the road. 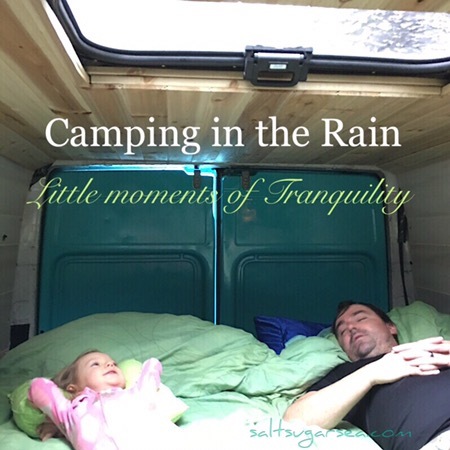 Outside the van, raindrops fall. The sounds ting above us, as they hit the metal roof of the van. A low crackle comes from the marine fireplace. Baby is peaceful, in a slumber of sweet dreams. Camping I. The rain is the ultimate lullaby. Pup doesn’t even move when I pull the blanket over her. The Husband softly snores, face first in his pillow. Everyone has drifted to sleep in our cozy wandering home on wheels. This rainy day has brought us a welcomed moment of idle time. The wind sends a swoosh of several drops crashing into the van all at once. Then a light trickle pitter-pats over the sunroof. For several minutes, the drops grow stronger, and the wind whistles through the trees. Then a calm sets in. Almost as if the rain has stopped, but then it drizzles on. Playing a natural symphony, full of beauty and surprise. I sit still, just breathing in this air. Thankful for the tiny tranquil moments, in between the adventures. What are your favorite rainy day activities? Please share with us in the comments. They can’t nap forever! Hey can you please give me any info you have on the sunroof you installed? Maybe point me in the direction of your build info? Any information would be greatly appreciated! Thank you! For sure! For the scariest part (cutting a hole in your roof) check out our YouTube on that time when we cut a hole for the Fantastic Fan https://youtu.be/3NgOlEqf_wA or search “Van Conversion: cutting a hole for Fantastic Fan”. This is the same way we cut a hole for the sunroof. We ordered the sunroof from Amazon for around $200. I wasn’t able to find which one we exactly ordered, but if you search “sunroof” on amazon, a lot of similar ones pop up. Ours has the option to just crack it for ventilation or removed the entire glass piece all together. We pretty much just cut the hole, set it in there and then added some sealant around the edges. It was perfect for adding some rays of natural light to the inside!